Mar Lan Construction was selected as Construction Manager at Risk to build the new 22,500 square foot addition to the Goppert Center for the City of Ottawa. We completed the project in October 2011 and the citizens of Ottawa love it! The Ottawa Community Recreation Center provides regulation and youth size basketball courts which can also be configured into one or two volleyball courts. The gym is equipped with a sound system and double scoreboards. There is a large multi-purpose room that also serves as an exercise classroom, an elevated walking/running track that runs the perimeter of the building, a fitness area, and all of the required amenities to make the Center a perfect facility for both youth and seniors alike. To make the facility more adaptable for community events, the building includes a warming kitchen and serving window so large community events can be scheduled in the activity area. 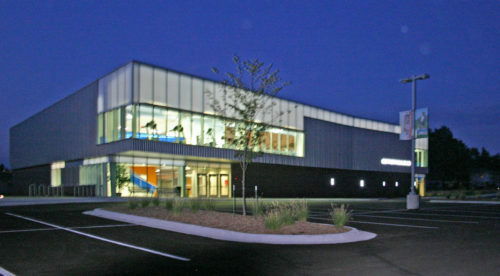 The exterior of the structure is a unique blend of masonry, metal and polycarbonate glazing which presents an open and inviting look to the facility. The translucent panels give a warm glow during evening hours while the clear glass allows views of the interior activity. If the participation of the community is an indicator of how the people of Ottawa feel about their new recreation center, Mar Lan can feel very satisfied they did a great job because the center has been embraced by the community and has become the hub of recreation.